Flowers and fruits are beautiful autumn decorations. 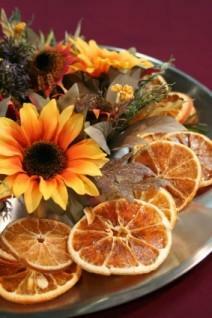 Get ready for a harvest celebration by using autumn party décor to liven up the celebration space. Hanging an autumn banner from a flagpole. Putting a mailbox cover featuring a fall scene on your postal box. Creating a cornshock around your windmill or flagpole. Making a fall colored balloon arch to go around the doorway. If it is windy, move the arch to frame an inside entrance to the party room. Hanging a welcome banner or wreath that features leaves, acorns and berries. Stringing garlands of nuts and berries to hang in the front entryway. Party decorations that follow the guests throughout your home, from the moment they arrive, can really set the scene. 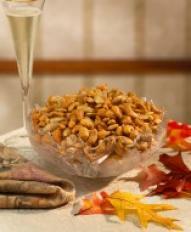 Display fall's abundance to capture the mood for your party. Switch out your regular accent pillows for ones in fall colors. Hang a fall-colored shower curtain and towels. Pick up a few discounted mahogany or gold-toned frames for displaying photos, instead of your regular silver or black. Display and light scented candles that smell like apple cider, pumpkin pie or hazelnut coffee. Hang a print featuring a harvest themed painting. You can buy low-cost reprints of paintings on poster paper at craft supply stores. By using some simple fall-colored home accents as part of your overall party decorating scheme, you save money on specialty items that can only be used for a short period of time. Avoiding Halloween and Thanksgiving decorations that feature monsters or pilgrims means you can leave your fall colored home accents up for a longer period of time. This makes decorating your home for a party easy. While it can be helpful to decorate using items already in your home, you should pick up a few special items for your autumn party. The types of items available depend on your party budget and theme. A kid's hayride party and an adult banquet will need to be decorated differently. For a large autumn party, you may need to rent some décor, especially if you live in an area of the country where seasons do not change drastically. Party supply rentals might include wagons, outdoor tents, hay bales or even turkeys and horses. Smaller items, like centerpieces, candelabras, and tableware, can also be rented from a supply store. Figure out if the cost of renting makes more sense than buying. Factor in your labor for making the items you plan to rent and if you will ever use them again. The best deals for party decorations are usually discount party supplies, found at party supply stores. There, you can pick up a number of fall-themed paper party goods that are cheap and cute. Get disposable napkins, plates, banners, and centerpieces to fill your home with fall cheer without emptying your pockets. An elegant dinner/dancing party calls for a more sophisticated decorating scheme. Luxurious cloth napkins, a matching autumn china set, and hand-carved pumpkins are perfect accents for a classy dinner party. You can even pick up champagne glasses with etched leaves for guests to enjoy their cocktails in. Metallic colors (golds, bronzes, coppers), lots of flickering candlelight, and fall floral arrangements will help enhance your chic decorations. A party for the kids is one that calls for fun decorations. Decorations with silly faces on turkeys, squirrels or leaves are perfect. Kids would also love to join in the decorating, so plan some fall crafts for kids that they can do at the beginning of the party and display until it is time to leave. Leaf wreaths, hand painted bird feeders and cornucopias are perfect to keep little hands busy and add some fall touches to your home for the party. Autumn is the perfect time for a harvest party. Use fall decorations to usher in the season, even if Mother Nature is not quite ready to give up on summer.